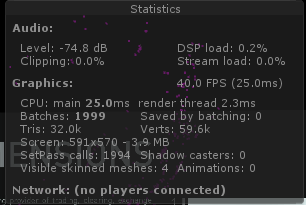 We are building an app that renders close to 3000 gameObjects (spheres) as a scatter plot. When we are looking at dense areas of the scatter plot, the frame rate drops to an unbearable level. Using the profiler, we see that the framerate is at 3-8 fps. We reduce the size to 200 spheres, and it is much better. Is there anyway to improve our performance. If not, what is the actual limit on the hololens. Wondering if there's any other possibilities to get the FPS up. spheres are super expensive to render. It takes a lot of polygons to make a sphere. Have you tried cubes? Did try cubes. It didn't seem to make a significant improvement. Is there any techniques to make this easier on the Hololens to render Ultimately we want a dynamic scatter plot where each point can be selected. Which is why we chose to make everything a gameobject. Instancing! Essentially same mesh but replicated by the gpu and different transforms applied to each instance. I'm running about 10K objects with 300 verts each at about 56 -60 fps. There is one draw call for all of them. Make sure stereo instancing is turned on in player settings and the same mesh is used. Your shader needs to be stereo instance enabled as well. However, i don't think it's working. How many draw calls do you have? If you are only drawing the spheres, there should be one draw call. If you have 2000 then its not working correctly. The blog above shows what happens with instancing. @AmerAmer Yes, I have around 2000 draw calls. I've attached my frame debugger and my stats window. As of recent here is what I have. I have switched to cubes (assuming it's easier to render). My original cube uses the HoloToolkit/Unlit Configurable shader. I went in and made it configurable for instancing (ie. adding the lines that were in the GPU instancing manual from my previous post). When i clone my cube, all of the clones have the same shader. This is the exact code i use for that. I have single pass rendering checked as you mentioned. This is puzzling: Now I want these to be dynamic, but i tried making the original parent cube static. 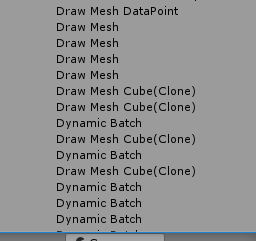 It makes all the clones static also, and changes the mesh to Combined Mesh at runtime. However I still have 2000 draw call. I thought static instancing was automatic if the objects were all same material/shader. Are you using Unity free? IF so batching is not supported. if not take a look at other suggestion below, although they are related to batching and instancing. Use prefabs of anything you're dynamically creating. it will make sure that everything is the same, at least during creation time. Try DrawInstanced but you would have one game object with an array of positions in that case. Check out this blog, he has good info on static batching, dynamic batching and instancing. maybe somebody else has some ideas but the blog above has some good suggestions as well. Got it, so static batching isn't available. But dynamic batching is free so that should work. Spent yesterday figuring out how to get dynamic batching working. The first problem was that everytime i made a clone, it was creating an instance of the material which prevented batching. The reason this happened is interesting. The holotoolkit scripts (things like gaze responder) access renderer.material. Any reference to .material creates a new instance of it. So i had to go into all the scripts and change them to .sharedmaterial. Changed the lighting to vertex-lit and voila batching starts to work. Here's the stats I have. It's much better than no dynamic batching but i still think i can do better. It runs at 15 fps on the hololens. But it seems to have broken some things like my cursor. Oh well. From what i understand Instancing is a step above dynamic batching. I'm not very clear on how to get instancing to work though. I would love to get near 50 fps. So, I'm not very familiar with .sharedMaterial. But i think it should always be available whenever you instantiate an existing object. If you don't mess with the material, it automatically shares material. But using sharedmaterial might break other use-cases. Again, i'm not very familiar with this. Perhaps someone with understanding about dynamic batching can shed insight. It's a shame the unity documentation on all this is somewhat sloppy. Very interesting. I created a new issue for this in the toolkit. Hopefully someone can review and comment. The holotoolkit scripts (things like gaze responder) access renderer.material. Any reference to .material creates a new instance of it. So i had to go into all the scripts and change them to .sharedmaterial. Changed the lighting to vertex-lit and voila batching starts to work. Here's the stats I have. It's much better than no dynamic batching but i still think i can do better. It runs at 15 fps on the hololens. But it seems to have broken some things like my cursor. Oh well. Be aware that improper use of renderer.material will cause memory leaks in your application. Just be aware that using the shared material will change the color for all of the objects. So if you're trying to highlight just one of them, and update the color, then they all will highlight. But I believe this does solve the dynamic batching by making all the renderers use the same material instance. This might be what you're looking for? Note that while it is possible to use renderer.SetPropertyBlock() on a shader property that does not have the [PerRendererData] keyword, Unity will simply create a new material instance behind your back. A side note, as far as I know the only scripts inside the HoloToolkit (not in the tests folders) that actually change the .material instance is SurfacePlane.cs, Utils.cs, DirectionIndicator.cs, and ManualHandControl.cs. Any of the other scripts in the Test folders are purely for examples only and most likely don't represent each developers needs and are not production ready, so go ahead and make your own implementation that fits your projects needs. Does anyone know if GPU instancing is available on the Hololens? Yes it is. You have to supply your transformations in a separate buffer as part of the binding but its done in one call. Your device has to run feature level 11_1. I don't know what unity is doing wrong but the device supports it. My current project developed in DirectX, not unity, is running a massive amount of meshes at a fairly stable frame rate. Just be aware that using the shared material will change the color for all of the objects. So if you're trying to highlight just one of them, and update the color, then they all will highlight. You are correct that changing color using .shared material changes all of the colors. However there is a work-around that i got working yesterday. You can use vertex coloring and have different colors for each object. You need an appropriate shader to get vertex coloring, but i simply added in the vertrex coloring parameters i needed to an existing shader to get it working. property to change the color independently. There's another Unity page somewhere about making a shader compatible with vertex coloring. Can't find it currently.